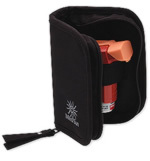 Activated by cold water, this diabetes carrying case keeps insulin cool for 45 hours. Lightweight and reusable, the FRIO insulin wallet holds 3-10ml vials of Insulin or 10 3ml cartridges. Measures 6 in x 5 1/2 in and is available in black, blue or burgundy.